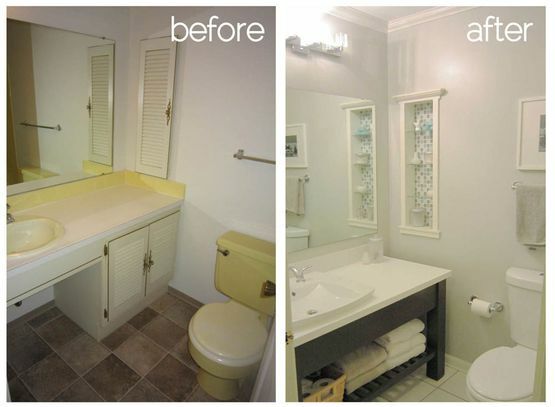 Every kitchen & bathroom deserves a fresh start, allowing you to achieve a totally new look, feel and flow. But rather than paying huge sums for removing all of the existing furnishings, why not choose a kitchen & bathroom Makeover? We stock a huge range of replacement worktops in a variety of wood, granite, laminate and solid surfaces, enabling a complete transformation with minimal disruption and at a fraction of the cost. Get your dream kitchen & bathroom with Ideal Homecare by choosing from a wide selection of styles and finishes. We provide a stress-free service. Many of our solutions don’t even require items removing from cupboards. 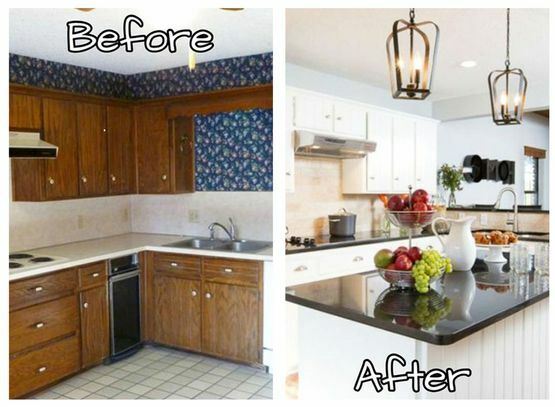 Ideal Homecare kitchen & bathroom makeovers - before and after. If you’d like something more comprehensive than a new layer, we can design, manufacture and install additional units, smart storage features, space-saving options, modern appliances and even the kitchen sink. We can also retile the walls and add splashbacks, providing a full service that removes the need for you to hire decorators, whilst ensuring that every inch of the kitchen & bathroom is designed as an integral part of the whole. To truly breathe new life into your kitchen & bathroom, we offer replacement cupboard doors that are made to measure. You can then pick from dozens of styles that are available in solid timber or as a vinyl that comes in multiple colours, adding an extra level of customisation. From simple lines and traditional details, to luxurious patterns and contemporary elegance, we have exactly what you need to make your kitchen reflect your personality and lifestyle. Whether you want to breathe new life into a current arrangement, tweak a few bits here and there in the process, or totally revolutionise the way your kitchen performs on a daily basis, our Kitchen Makeover service is the answer. We’ve helped countless customers to design kitchens that deliver comfort, efficiency, high levels of hygiene and everything required for cooking, dining, relaxing and entertaining – all you have to do is share your vision with us. For everything from new surfaces and doors, to adding a breakfast bar and upgrading your appliances, please email sales@idealhomecare.co.uk or give us a call on 0121 588 5737.